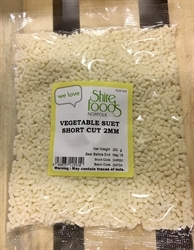 Vegetarian suet can be used in the same way as standard beef. It is made from vegetable fats, with no animal product. It is suitable for vegetarians. Pack Size: 200g. Can be used for pies, pastries and puddings.